Defining your brand is a crucial first step on the path to business success. A clearly defined brand communicates why customers need to buy your product or service. What makes your brand better? How can your brand improve their life? 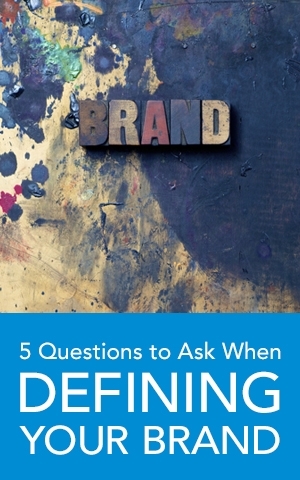 Below are five questions to ask when you start to define your brand. 1. What is my mission? Why are you in business in the first place? Is it to help people? Fill an untapped niche market? Or, do you have a genius idea that you want to share with the world? Take some time to really dig deep and understand your mission. It is the foundation of your brand. 2. What makes my product or service better than the competition? Is your product or service more reliable, cheaper, cooler? Ask yourself how you’d like your customer to describe your product or service to their friends. Word of mouth is the best form of advertising and you have the power to influence what people say by carefully planning your brand. Understanding your target audience determines the voice of your company. You’ll use a different tone of voice for twenty-somethings than you will for seniors. Using the wrong voice can be a big turn-off or even be seen as offensive. How do you want your company to be perceived? Are you a fun and laid-back company? Or, are you serious and formal? It’s important to remain consistent across all communications once you’ve established your voice. 4. What do my current and/or potential customers already think of my company? Perhaps you’re an established company looking to improve your brand. You may want to conduct some informal research to learn what your customers think. Simply asking for feedback in conversation may be enough. But, you may also consider surveying your client base. Who knows-you might be surprised by what you learn. 5. What do I want them to think? This is where you build upon the previous steps. Is your mission in line with your customers’ perceptions? If so, great! You need to keep working to strengthen the great brand you’ve established. If not, you have some work to do. Don’t worry. Now you know and you’ve given yourself the opportunity to make some changes. If you’re a new company – you’re in luck. You have a clean slate. Use the foundation you’ve created in the previous steps to tell your customer why they need to give you their business. Defining your brand is more than just a cool logo and clever slogan. It’s how your customers and non-customers perceive you. What you say, what you do and how you act all influence whether or not customers will buy from you. The success of any business is built upon a carefully crafted business plan that includes a well though-out branding strategy. Take what you’ve learned here and you’ll be well on your way. Good luck!